We informed you right here in this Blog back in September of 2012 that ASE was chosen once again by the movie industry to supply products to the set to help support their filming. In this case, we supplied a Hein Werner transmission jack to the set to aid them in servicing the vehicles that would take part in the film. The Sony Pictures film is set to premier on February 12, 2014. You may have already seen ads for it on TV. It stars Michael Keaton, Joel Kinnaman, Gary Oldman and Samuel L. Jackson. If it’s anything like the SciFi original, which was shot back in the 1980’s starring Peter Weller, it will be a great film. Give us some feedback on the movie whether you like it or not. Just let us know how it is. With the wide variety of Transmission Jacks out there, it can be a daunting task to try to choose the proper jack for your application. It can be equally as difficult to determine which manufacturer to choose as well. That’s where this post comes in. ASEdeals.com carries a huge selection of transmission jacks by several manufacturers. There are two types of transmission jacks. There are low profile transmission jacks, and then there are the full rise transmission jacks for full rise lifts, like the typical Two Post Lifts or four post lift. 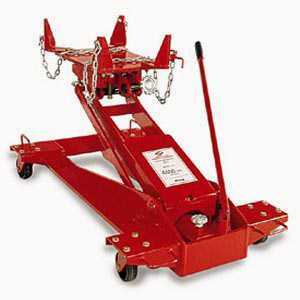 The full rise transmission jacks are the most popular jacks for most commercial auto shops, while the low rise transmission jack is the most likely choice for the typical home hobbyist who doesn’t have access to a full rise lift. When it comes to the low rise jacks, we have four different manufacturers that offer them. Hein Werner, AFF, Zinko and Omega. Our most popular model is the heavy duty model 3180 by AFF. This is a monster jack that handles up to 4400 lbs. for some of the largest transmissions out there. Most customers will only need a model with a 1000 to 2000 lb. capacity. They typically have a lifting height of approximately 30 inches. The full rise models are available in two stage or single stage models. Two stage models have a two stage hydraulic cylinder instead of only a single stage cylinder. This allows a greater capacity, a lower lowered height, and a higher raised height. Most customers prefer a two stage model. These jacks will typically have a fully adjustable saddle. They can lift anywhere from around 36 to 81 inches. They are also available in air powered (pneumatic) only instead of hydraulic. Our most popular full rise telescoping Transmission Jack is our Ranger Model RTJ-1. This is a two stage model with a fully adjustable saddle and a one ton capacity. It also has a foot pedal for hands free operation. Call or email us with any questions, and we will get you the answers you need to choose the right model for your application. You are currently browsing the archives for the Transmission Jacks category.